Hair separates class winners from champions. Epic provides longer, denser hair. Contains I.C.E.™, a technology that helps animals stay hydrated under heat stress. There's no melatonin or added copper. I.C.E.® is a nutritional technology that helps ruminants cope with heat stress. One of the key ingredients in I.C.E.® works as an osmolite to help livestock remain hydrated during hot weather. Components in I.C.E.® also have been shown to complement Heat Shock Proteins that help animals minimize internal cellular damage caused. 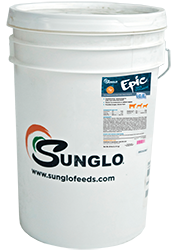 Feed 8 ounces per head per day to cattle and 2 ounces per head per day to goats and sheep. Keep animals in a cool, dry environment to help enhance hair coats and growth.